Hands up who’d feel comfortable taking beauty tips from a piece of plastic? The counter assistants may often look quite toy-like with their orange makeup and Botoxed foreheads, but at least they’re real, as opposed to a machine that analyses your face shape. We’ve all heard how a symmetrical face is considered the most attractive, well now your DS will tell you just what you’re lacking! You use a scanning device to upload your images, and the software categorizes you into one of four groups. You’ll either be cool, active, cute or feminine, and there’s no arguing with it. 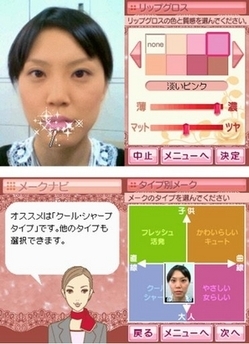 Next step is a makeover, and you get to see your photo superimposed with Shiseido products. You can either opt for their service, where they’ll give you a look suitable for work and dates, or choose to design your own look from their colour palette. The idea is that this game will be aimed at 20-30 year olds, who aren’t generally involved in gaming. Personally, I think the main appeal will be the tween generation, as they get to dress up in face paint without their elder sisters shouting at them.